Example Names Mordin Solus, Kirrahe, Chorban, Anoleis. The second species to join the Citadel, the salarians are warm-blooded amphibians native to the planet Sur'Kesh. Salarians possess a hyperactive metabolism; they think fast, talk fast, and move fast. To salarians, other species seem sluggish and dull-witted, especially the elcor. Unfortunately, their metabolic speed leaves them with a relatively short lifespan; salarians over the age of 40 are a rarity. Salarians are known for their observational capability and non-linear thinking. This manifests as an aptitude for research and espionage. They are constantly experimenting and inventing, and it is generally accepted that they always know more than they are letting on. Salarians, who possess one of the three permanent Citadel Council seats, are a species renowned for their mental acuity, technical skill and their high aptitude for espionage. Salarians have a very high metabolism rate, lowering their life expectancy to about 40 Earth years, but also necessitating very little sleep, around 1-2 hours per day. In the interstellar community, they have created many of the major technological advances that now fill the galaxy. Highly intelligent, their mental acuity is galactically renowned. In fact, they are considered to be hyperactive by most other races; salarians, however, disagree with this prognosis, considering other races to be slow and dim-witted.The Salarian Union is largely governed by a group of dynastic families ruled by female elders. Of the three permanent Council species, their economy is the smallest, but is still substantially larger than that of the human Systems Alliance. The salarians were responsible for the elevation of the krogan race to combat the invading rachni, and they were subsequently responsible for creating the "Genophage" biological weapon used to quell the later Krogan Rebellions. Militarily, they are considerably weaker than the turians in head-on combat, preferring to employ sabotage, reconnaissance, counter-intelligence and commando operations against any enemy. Salarians are thin, highly energetic bipeds that stand 1.3 to 1.5m high and weight around 50kg tending to be fidgetyand speak quickly. Salarians prefer to sneak around and attack enemies when they know their weaknesses and have all the information about an enemy they can acquire rather than attack head on like a Krogan. When they do find themselves in face to face combat situations they act decisively and in a manner that ends the combat as quickly as possible. It is far more common is to find Salarians dealing in politics, espionage and technologies. Being of higher intelligence and needing only a few hours of sleep a night gives them an advantage over the other species that sleep far more. If there is anything to be gained from a piece of information the Salarians will have their hands in the pot long before the others races even have a chance to discover it. Salarians active in the Galaxy tend to be 10 to 25 years old . Salarians have a faster than normal metabolism, often appearing jittery. They also possess a keen intellect, rarely forgetting any fact or figure. The salarians are a bipedal race of amphibians, with tall, elongated bodies well-suited for their high metabolism, and skeletons composed of more cartilage than those of other races such as humans. Salarian heads are long and thin,and have a pair of horns protruding from the top of their skulls. Skin varies in color, from bright reds and greens to the more common shades of blue or grey. Their blood is a greenish color. Salarian eyes are large and oval and have thin membranes in place of eyelids. The pupils are a wide slit, oriented horizontally, and the irises can be dark green, purple, or brown. Salarians blink upwards, rather than downwards as humans do. Salarians are not notably religious, but as free-willed sentients there are exceptions. One of the less favored salarian religions worships a goddess, and claims that a certain pattern of overlapping craters in the southern hemisphere of Trelyn resembles her. Salarian biotics are unusual and highly prized. During character creation for every 1 skill point spent in Knowledge: Survival, Knowledge: Law Enforcement, Perception: Investigation, Perception: Hide, Perception: Stealth, Perception: Search, Technical: Electronics, Technical: Decryption, they gain 2 points (maximum of +6). Salarians may take one additional action each turn without incurring -3 to either. If more than two actions are taken in a turn this bonus is negated and full negatives are incurred. Also salarians only require one hour of sleep each day. This does not give them the healing benefits of 8 hours of rest in only one hour, only mitigates the need for 8 hours of sleep. Natural healing still works as normal. A salarian may choose to reroll any Swim check, but the result of the reroll must be accepted even if it is worse. In addition, a salarian may choose to take 10 on Swim checks even when distracted or threatened. They must still meet the minimum Take 10 requirements to do so, however. Salarians ignore negative modifiers from darkness up to 25 meters. 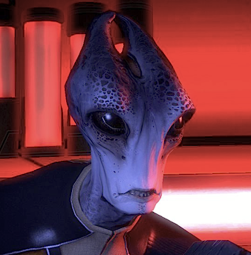 Salarian entry on Mass Effect Wiki.